Get our social media cheat sheet. An insanely practical 6 step formula for exploding any brand in 15 mins a day. Get more customers and explode your social media presence, without the confusion! If you’re a small business that wants to cut through the noise and become obvious choice for your customers, you’ve come to the right place. Our #1 priority is constant learning. Marketing literally changes daily, and we want to be ahead of every trend, so our strategies are always cutting-edge. We do all the hard work so you don’t have to. Digital marketing doesn’t need to be complicated, and our superpower is making things simple. There’s an unlimited amount of things you could do, but to get results you only need a few fundamentals. We’d catch a grenade for our clients. Okay maybe we don’t go that far, but we go above and beyond to make sure they are overjoyed. If you’re one of our clients, you’re part of our family. If you’re ready to accelerate your growth, the next step is a 15 minute fast-track call. Together we’ll get clear on where you are now, where you want to go, and how you can bridge the gap! We're on a mission to make world-class marketing available to small businesses. 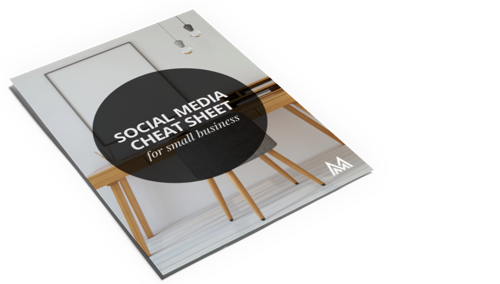 Get your free copy of the social media cheat sheet. An insanely practical, must-have guide for small businesses who want to supercharge their social media in 15 minutes a day.